Posted March 25th, 2019 & filed under England Carrier Services. Whether you’re simply looking to fuel your rig or looking for a place to rest up, a truck stop has just what you need. 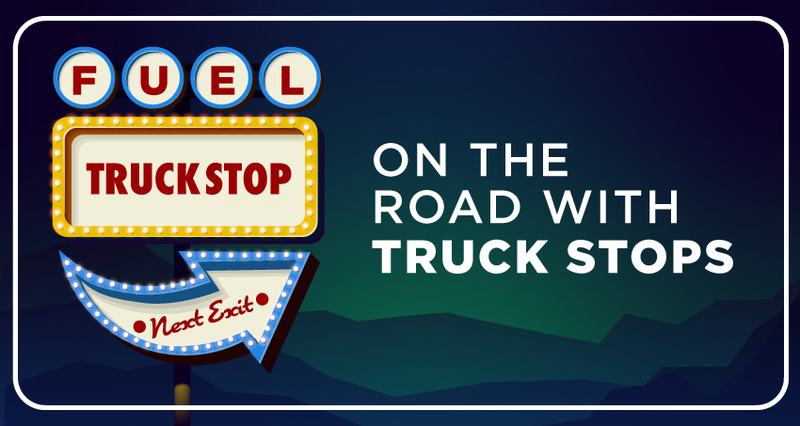 Truck stops started out as a place to only stop and fuel your truck before getting right back on the road. Other amenities weren’t easily accessible due to the outdated mindset of stop, fuel and go. These days there is a variety of services to make those long road trips more comfortable. It’s now very common to have a one-stop-shop where drivers have plenty of access to adequate parking, truck services and maintenance, and can catch up on email. You can usually do this all while grabbing a bite to eat. In essence, a truck stop has become a small metropolis of services and amenities for drivers to take care of their needs while on the road. Merchandise – food, clothing, electronics, etc. Truck stops also continue to advertise fuel quality and associated bio levels to draw drivers to their location. Quality fuel means less downtime. Less downtime equals fewer headaches and more efficient transportation. In addition to the list of amenities mentioned above, many truck stops are implementing enhanced services for guests. You can now enjoy preventative and light mechanical services at a discount and at more locations. Rather than trying to track down the nearest shop or getting stuck on the side of the road, drivers can service their trucks, fuel up and refresh all at one stop. If you do happen to breakdown, you have a bigger network ready to help out. 24/7 roadside assistance is now offered by many truck stops along with a nationwide network of truck maintenance locations. Wherever you find yourself, chances are there’s a truck stop nearby to get you back on the open road. In additions, if you are using a fuel network, many truck stops including Love’s and TA Petro work with companies such as England Carrier Services to display their fuel rates and stop amenities in one convenient app similar to Trucker Tools. This allows you to make the most educated decision on the best stops along your route for your specific needs. Free mobile apps such as this are designed specifically to keep drivers comfortable. Thanks to the modern-day truck stop, drivers can enjoy those long trips with access to a few of the amenities found at home. Next time you drive past a truck stop, don’t be afraid to stop in and find all it has to offer.